South Africa has regained the title of Africa's largest economy, two years after Nigeria rebased its economy to claim the spot, according to IMF data. A recalculation using current exchange rates put South Africa on top because the rand has strengthened against the dollar. 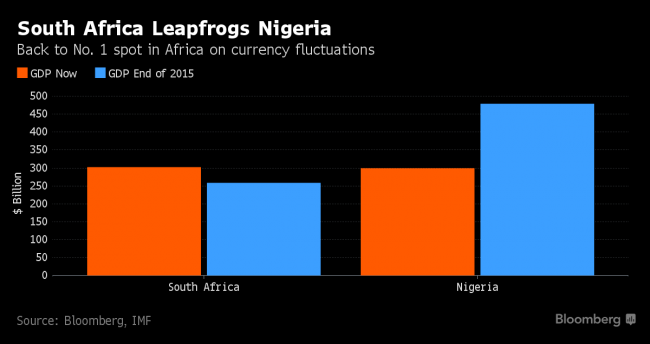 Nigeria's currency has fallen sharply since a peg to the dollar was dropped. According to BBC Africa Business both economies could be on the brink of recession. Nigeria rebased its economy in 2014 to include previously uncounted industries like telecoms, information technology, music, online sales, airlines, and film production. Most countries do rebasing, updating the measure of the size of the economy, at least every three years or so, but Nigeria had not updated the components in its GDP base year since 1990. On the basis of these numbers, there's not a lot between the two. South Africa's economy is worth around $301bn and Nigeria comes in at $296bn. The exercise in calculating the numbers using last year's IMF figures and this year's currency exchange numbers, technically puts South Africa back on top. While the results of the recent municipal elections is feeding positive sentiment back into the markets, the South African Reserve Bank forecasts zero growth for 2016, while unemployment still remains above 26%. In July, South Africa stepped past Egypt as the continents' second largest economy in dollar terms, having dropped behind the North African country earlier in the year.